The 3:00 game at BB&T Field in Winston-Salem features two undefeated 4AA teams in Wake Forest and Mallard Creek. These two teams have met in the title game twice before with Mallard Creek victorious both times, in 2013 and 2014, but Wake Forest broke through last year and defeated Page in the title game. The Cougars come into this matchup with the targets on their backs as the defending 4AA state champion. 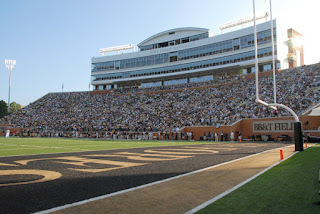 Wake Forest has a fairly balanced offensive attack, averaging 238 yards on the ground and 134 yards through the air. Leading the rushing attack for the Cougars is senior running back Devin Lawrence, who has found the end zone 32 times this season. Quarterback Chris James has passed for over 1800 yards and 22 touchdowns. Coach Reggie Lucas is especially proud of his defense, which has held eight opponents to ten points or less this season and has posted three shutouts. The Mavericks with Mallard Creek of played one of the toughest schedules in North Carolina this season with two state finalists and two regional finalists on the slate of games. And the Mavericks had to do it with almost entirely new line up. Coach Mike Palmieri wasn't sure how his team was going to be on the field this season with 19 new starters, but after 14 games it's clear to see in that they're back to playing the type of Mallard Creek football that won three straight state titles between 2013 and 2015.